Mongolia is known as the “Land of the Horsemen,” and horses outnumber people in Mongolia. Horses are used for transportation, milk, and meat. Russian missionaries began the Adventist work in Mongolia in 1926. Following communist rule, Adventists returned in 1991. The first Adventist publications in Mongolian consisted of a hymn, mimeographed at the Russian Mission press at Harbin, Manchuria; and sometime later, four small tracts. ighth grader Bumchin [pronounced: BUM-chin] wanted to go to church when his family moved to a mountainous town in rural Mongolia. But his new town didn’t have a Seventh-day Adventist church. Many of the 10,000 residents were Buddhist, just like his parents. He found one Christian church that met on Sundays—in the home of his new math teacher. Bumchin was scared to go to his math teacher’s home. “I was a bad student in math, so I was worried to go to her church,” he said. Not many people in Mongolia have heard about the Adventist Church, but Bumchin knew the church well. He had worshipped at the Adventist church in his old town at the invitation of an Adventist relative. Then the pastor had taken him to an Adventist youth conference in Mongolia’s capital, Ulaanbaatar. Bumchin realized at the conference that missionaries were needed in Mongolia, and after moving to the new town, he wondered how he could be a missionary. As Bumchin pondered his next move, he began climbing up a mountain near his home every morning. At the top of the mountain, Bumchin sang Christian songs and prayed to God to guide him. “Please, God, use me,” he prayed. One morning after prayer, he charged down the mountain and went straight to the Sunday church. He felt a little awkward when he walked inside and saw that he was the only child in a room of 20 adults. But he soon forgot about his discomfort as he listened to the adults talk. The church was about to close forever. “This is the last meeting of our church,” a church member said. “Why go on with so few members?” said another one. The church members were discouraged that many people had stopped coming to worship on Sundays. A few days later, several church members joined Bumchin in climbing up the mountain to pray. Bumchin contacted the pastor of his old Adventist church and invited him to preach Adventist beliefs at the Sunday church. The pastor agreed if Bumchin helped him, and the two gave Bible presentations once a month for the next six months. The church’s membership grew to 27, and Bumchin’s classmates also began to attend the services. At the end of the year, all 27 church members traveled to the Adventist pastor’s church to pray with the Adventist members at a special Christmas program. When the church members returned home, they voted unanimously to turn their church into an Adventist church. It is the only time that a whole church has been converted in the Adventist Church’s 27-year history in Mongolia. The new church grew to 40 members by the time that Bumchin moved to Ulaanbaatar as an adult. But Bumchin, now 27, hasn’t stopped planting Adventist churches. 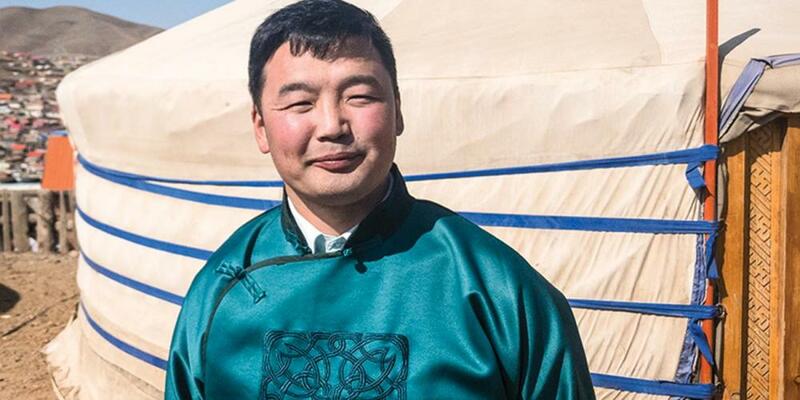 Today, he is a Global Mission pioneer and the leader of Mongolia’s only Pathfinder church, which he and his wife opened in 2012 in their home, a traditional Mongolian yurt. The Khutul Seventh-day Adventist Church has an average Sabbath attendance of 60 people, including 45 Pathfinders. The Adventist Church in Mongolia recognized it as an official church in March 2017, and its first 10 baptisms took place in June 2017. Bumchin’s eighth-grade math teacher, meanwhile, still teaches math. But now she lives in Ulaanbaatar and teaches at Tusgal School, the only Adventist school in Mongolia and a recipient of the Thirteenth Sabbath Offering in 2015. What does Bumchin want to do next? “I want to plant churches around Mongolia,” he said.